Where is the Henry County Superior Courthouse located? Where is the Henry County Superior Court in Georgia located? 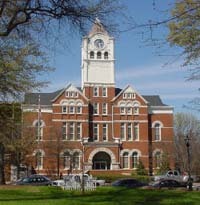 The historical Henry County Courthouse, built in 1897, is located on Highway 23/42 on the square in McDonough, Georgia. Parking is available for Courthouse business on Lawrenceville Street, 1/2 block off the Square. For a Divorce in Georgia, what Superior Court will the "complaint" be filed? The plaintiff is the person seeking a divorce. The defendant is their spouse. The complaint is filed in the Superior Court of the defendant. Example: If you are living in Clayton County and your spouse, whom you wish to divorce resides in McDonough Georgia, which is in Henry County, the complaint would be filed in the Henry County Superior Court not the Clayton County Superior Court.